A gap in posting, an interruption in our lives. When last I wrote here, I didn't say much why I was suspending posting. I was hurrying to Italy to stay close to my father, who had been admitted to the hospital in critical conditions. My father remained in intensive care for over six weeks, followed by another month in intermediate care. He was dismissed from the hospital only yesterday, not to return home, but to go to a rehabilitation center, where he may remain for several months yet, still very weak and by no means out of danger. We arrived in Genoa in July, with a minimum of summer clothing, never expecting we would stay so long. We are still here, and, although we are planning to return to Denver for a short while, we'll have to come back to Italy for another extended stay, until my father is strong enough to be moved closer to my brother. Packing in a hurry, we forgot many things, but fortunately we brought a couple of portable computers: an older laptop for me, a newer netbook for Nina. Since my father's house has a decent Internet connection, both of us have been able to translate - although not full-tilt. Being here is taking an increasing toll on us, both because of the many gloomy reports from the doctors and the few cautiously optimistic ones, and because of our unsettling situation, without a date for our return and a backlog steadily accumulating in Denver. I had to cancel our planned participation at the ATA Conference; there was a session listed under my name (IC-11, Blogging 101, on Saturday morning), but it will be given by Corinne McKay, who has very kindly accepted to present it in my stead. Corinne, with her engaging style, will certainly do a much better job than I could - I encourage everybody to go and enjoy her lively presentation! I've kept up working and also teaching my online localization course for Denver University, but something had to give, and it was this blog. I'll now try to resume: I learned a few things about working away from home for months on end, and I'll share them with you. I'll also write about new Italian dictionaries, and about some utilities to help extending the useful life of an underpowered computer. I plan to tinker with the back-end of this blog: a new and more readable template, branching out to an Italian language blog for posts about Italian translation, and even, if I find a way to load them in Blogger, some Flash tutorials about new tools and techniques. I hope I won't leave again such a large gap between posts, although I cannot promise it yet: my family emergency might yet prevent me from blogging. 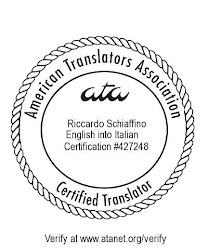 Please stay tuned, and thank you for reading About Translation. If Corinne needs help just let me know. Just remember that family always comes first. Always. Sending you and your family lots of good thoughts across the pond! Please, do not forget about this blog again ;) I'm a permanent reader..